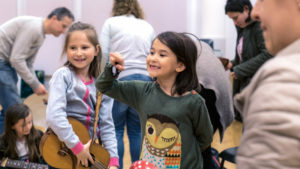 So you’ve got a great idea for a music project that will get lots of children excited about participating in music-making, enrich their lives and build their confidence and social skills. The only thing you have to do now is find the funding to help turn your idea into reality. To help you get your project off the ground we’ve put together a list of the 7 best sources of funding for music education projects. Of course, it’s not just a matter of filling in the application forms, sending them off and then crossing your fingers and hoping for the best, you’ve got to spend time thinking carefully about your project. How does it fulfil a need that is currently going unmet in your area? How does it fit with a funder’s aims and objectives? What impact will the project have? How can you sustain the project long-term once the initial funds have run out? The better you can answer these questions in your application, the more chance there is that you will be successful. Often the easiest place to find funding is from the people who already know and trust your work. Perhaps you already deliver some fabulous work for a community organisations which makes a real difference to the lives of the young people you work with? Or you work in a school which really values your input? Could there be scope to develop this work further or take it in another direction? If the organisation or school is not prepared to pay you more to deliver more work then ask yourself why not? Are you articulating the musical, personal and social benefits they are getting clearly enough? There are pots of money available for work that supports certain groups such as NEETs or for areas that are particularly deprived. So ask the organisation you work for whether they have access to this funding, how it is currently used and whether there is scope to direct some of it to your project. But you should always think about how you can sustain your service long term. Cultivate good relationships with other local providers and charities who make bids to funders and work with them so that you become a delivery partner in their funded work. For example, a club for children with a disability might make a bid to a charitable foundation to expand the number of trips and activities they can offer – one of those activities might be a 6-week music course delivered by you. Most larger Music Education Hubs (led by County Music Services) have a small pot of money to support innovative work. Their business is music education. They offer one to one lessons, ensembles and they work to support schools to offer high quality music in the classroom. They will have a good idea of what the gaps in provision are in their area. Before going to them asking for money, try to meet to find out what their plans and priorities are. Once you have done this, you can explain how your project links with the Music Education Hub’s priorities or perhaps tailor your project so that it meets them better. Most counties have a community foundation which provides information about local trusts and grant givers who want to make a difference in their area. They can often help to match you up with the best funder and the application is straightforward and quick to do. The funding offered ranges from about £250 to £5000. Information about how to access these funds will be on the relevant local authority’s website but here are the links for Hertfordshire, Cambridgeshire and Essex. The c hildren’s charity Youth Music is often the first on the list for anyone running a music education organisation. However, funding is very competitive and the application process is demanding, particularly if you don’t have access to a dedicated fundraiser. 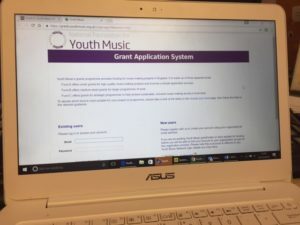 Youth Music offer smaller grants (Fund A) which have a shorter application and quicker turnaround time. They are particularly interested in outcomes so you will need to think about the impact of your project on young people’s personal and social development as well as their musical development. You can get help with your Youth Music application from MusicNet East. We wondered whether to include this one in the list as it’s more of a who not to apply to but we thought it might be useful to understand where Grants for the Arts fits into the funding landscape so that you don’t waste time making an application that is unlikely to be successful. Grants for the Arts is the Arts Council’s fund for individuals and organisations and you can bid for between £1000 and £100,000. It is worth knowing that the Arts Council administrate Music Education Hub funding and Youth Music’s funding from National Lottery funds. If you ask them for money for music education therefore, they are likely to ask you why you didn’t go to Youth Music or your local Music Education Hub and direct you back to them. That said, the Arts Council does fund projects that develop new artists, employ and/or commission artists and musicians and offer young people opportunities to experience the arts. Festivals, music industry links and help for emerging young composers/ songwriters are likely to engage their interest. If in doubt, ask them for advice before you spend a lot of time and energy on an application. The Arts Council would rather talk to you for 10 minutes about your idea than invest hours of an officer’s time to evaluate your funding application only to turn you down. They also provide a lot of useful advice about finding funding on their website. Children in Need, the Big Lottery Fund and Awards For All are all generic funders who do sometimes fund music activities. However their focus is generally on the impact the activity can make on the participants rather than the intrinsic value of the music. Again, these funds are very competitive and you would be wise to engage, or at least seek the advice of, a professional fundraiser. However we know of at least one music programme which has so convinced its funder of its value that they have asked the organisation to re-apply for more money! We hope this list helps you make sense of all the funding options available and which ones might best suit your project. We offer more detailed advice on how to write funding applications at our Routes into Teaching days. These sessions also offer an introduction to large group teaching and the range of teaching opportunities that are available within music services. We can also offer a fundraising consultancy service to help you complete funding applications. For more information contact us.